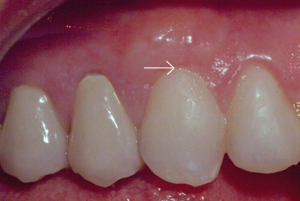 Large vertical defect present on mesial surface of bridge abutment tooth #3. Probing depth 8mm. 63 y/o man. 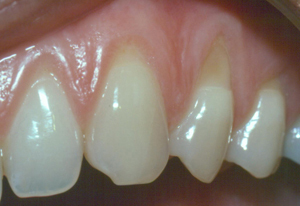 Radiograph shows healing result 3 years following Emdogain regeneration surgery. Probing depth 4mm. 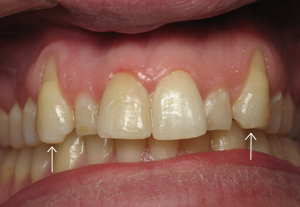 Significant bone fill 5 months following regenerative surgery with Emdogain (enamel matrix protein). 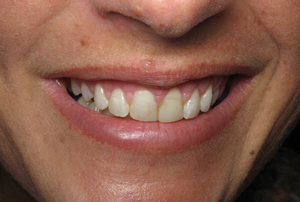 Dramatic bone fill three years after Emdogain regeneration surgery. 3-4mm probing depths.